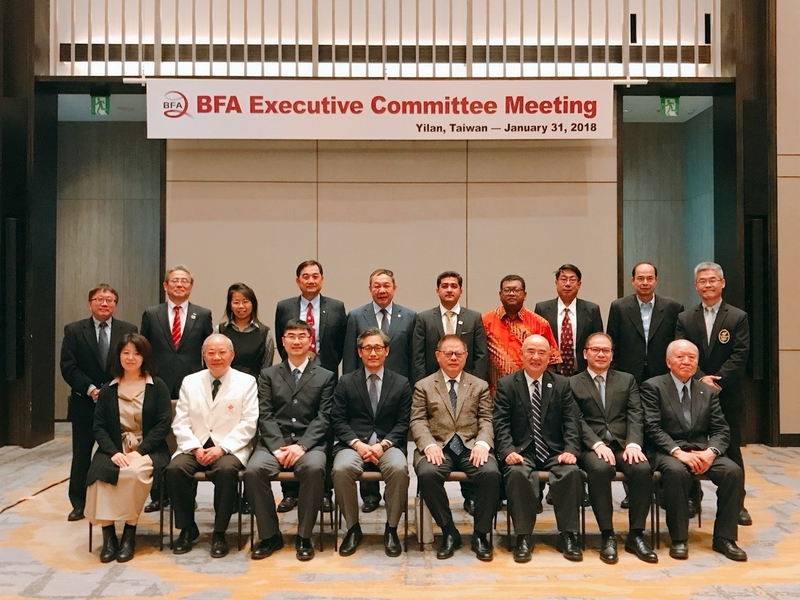 BFA EC Meeting opened with a minute’s silence to　late EC member Syed Khawar Shah of Pakistan who passed away on January 16, 2018 at the age of 68. EC unanimously approved the minutes from the last Congress Meeting (July. 4, 2017, Yilan), 2017 Closing Budget and 2018 Budget Plan, and Review of 2017 BFA activities. Some important amendment to BFA U-12, U-15, U-18, Asian Championship, Women’s Asian Cup was also unanimously approved, so was the amendment to BFA Event Hosting Manual. All member Federations are required to study these changes which will be informed by BFA Secretariat. 3. Agenda: The following 2018 BFA tournaments and events were tabled and approved. a. 2018 XII BFA East Asia Baseball Cup in Hong Kong, June 24-29, 2018.
b. 2018 X BFA U12 Baseball Championship in Taipei, Taiwan, August 13 - 19, 2018.
c.	2018 XII U18 Baseball Championship in Miyazaki, September 3-10.
d.	2018 Asian Games, Jakarta, Indonesia, August 26 - September 1st. (subject to confirmation). Report by Mr. Leo Agus Cahyono, IBSF was supplemented by Mr. Chris Day who inspected the first ground in Senayan (South Jakarta) with Jeff Kun in December when BFA and IBSF requested OCA and INASGOC to rectify the oversight, expedite construction of second field (in Senayan). The BFA technical representative will visit Jakarta again in February to monitor the progress . e.	2018 BFA Coach Clinic, location and date to be advised later. f.	2018 BFA Umpire Clinic, in Indonesia, prior to the Asian Games. g.	2018 2nd Executive Committee Meeting, location and date to be advised. I.	Mr. Tsutomu Shida was appointed by President Peng to “BFA Counselor” and Dr. Kaku to “BFA Medical Advisor”. To promote world peace and brotherhood, he and his partner Mr. Shih Pao Lin are going to collect 25,000 baseballs, new, old and signed by famous baseball players from around the world. The ultimate goal is to become an instrumental visual part of the 2020 Summer Olympic Games in Tokyo, Japan. The commission is to increase the profile of women’s baseball in Asia, improving opportunities and developing pathways for girls and women of all ages and skill levels to play baseball. The Women’s Commission will include 4 top-ranked Federations, Japan, Chinese Taipei, Korea, and Hong Kong. BFA appointed Mr. Syed Fakhar Ali Shah as the Executive Director of West Asia Baseball Development, to continue the growth of baseball in West Asia. V.	Dubai Cup: Thanks to cooperation by UAE Baseball Softball Federation, the first Dubai Cup between India and Pakistan was held in Dubai from December 8-10, 2017. Mr. Syed Fakhar Ali Shah urged BFA to connect with Arab area and give support for baseball development. VI. Issue of Malaysia: Mr. Kazuhiro Tawa, BFA Senior Advisor visited Malaysia last September. Federation Baseball Malaysia (FBM) has been suspended by Olympic Council of Malaysia(OCM) over failure to repay debt 2007 SEA Games in Indonesia. Nevertheless, the new FBM administration based at Universiti Putra Malaysia (UPM) is trying hard to rebuild baseball in Malaysia by holding UPM Championship and umpire clinic in 2017 aiming to return to fold.